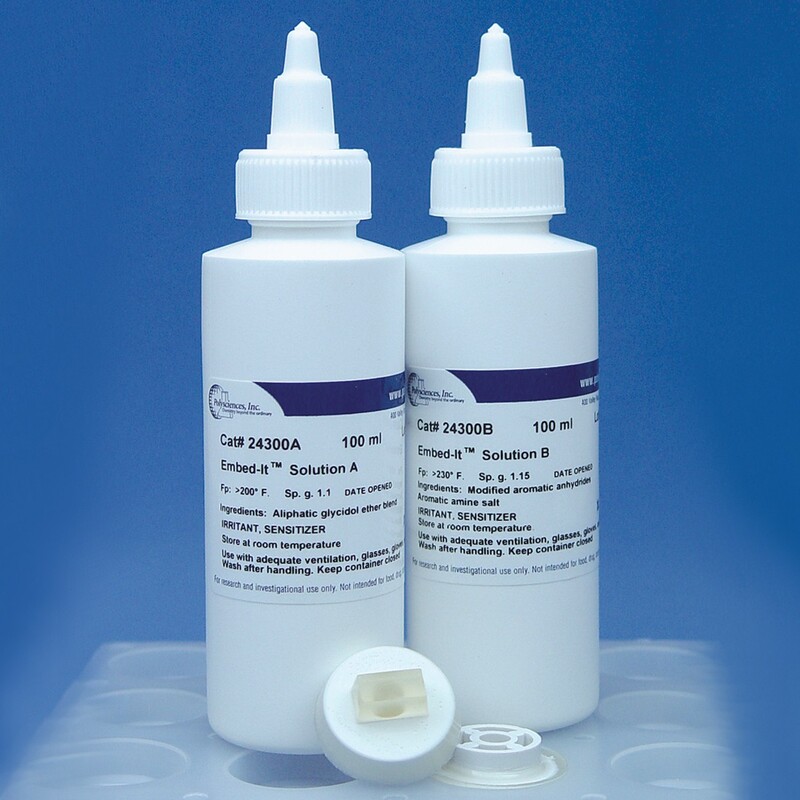 Embed-It Low Viscosity Epoxy Kit | Polysciences, Inc.
A modification of the Spurr's formulation, Embed-It™ Low Viscosity Epoxy Kit can be used for embedding biological, material and mineralogical samples. This kit is composed of two very low viscosity components (~65cps) packaged in easy to dispense squeeze top bottles. Components are mixed in equal parts by weight to make the infiltration and embedding resin. The resin readily penetrates into the specimen and cures to a clear hard solid overnight at 60°C. Elhajjar Rani F, Law Chiu T, Magnetomechanical local-global effects in magnetostrictive composite materials. Modelling Simul. Mater. Sci. Eng. 23 (2015) 075002(13pp). Troiano Nancy W., Goldberg Carolyn G., Schlachter Penny B., Kacena Melissa A. Paint Chip Analysis in a Forensic Investigation: Lessons Learned From Metal Bone Implants. Journal of Histotechnology, 2013 July, 25-27. Hartmann M1, Berditsch M, Hawecker J, Ardakani MF, Gerthsen D, Ulrich AS. Damage of the bacterial cell envelope by antimicrobial peptides gramicidin S and PGLa as revealed by transmission and scanning electron microscopy. Antimicrob Agents Chemother. 2010 Aug;54(8):3132-42.